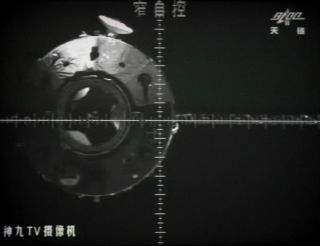 A giant screen at the Jiuquan space center shows the Tiangong-1 space lab from a camera in the Shenzhou-9 spacecraft before the automatic docking on July 18, 2012. The Chinese space lab is expected to re-enter our atmosphere between March 30 and April 2, 2018. China's first space station, the bus-size Tiangong-1, is falling uncontrollably toward Earth, with a fiery plunge through our atmosphere expected sometime between March 30 and April 2. And the dive will, in fact, be a blazing one: Scientists expect that as the station burns up, it will generate huge fireballs visible from the ground. Tiangong-1, which has attracted worldwide attention these past few weeks ahead of its demise, launched in 2011 and hosted two space crews before contact was lost with the craft in 2016. Since then, Tiangong-1 has been falling closer to Earth without control from Chinese space officials. "What happens is that there are some dense sections of the lab connected together by a rather thin structure," McDowell said, explaining the source of the fireballs. "The thin structure melts first, turning the lab into a bunch — a few to a few dozen, depending — of independent pieces which melt and burn more slowly — fireballs." In addition to human-made objects, many tons of meteors hit Earth every year, mostly in the form of dust. Occasionally, larger rocky meteors break up in the atmosphere and hit the planet. The resulting meteorites are highly prized by collectors. In January, a small meteor broke up over Michigan, and collectors found pieces of the object on the ice within a day of its fall. In a more spectacular example, a 56-foot-across (17 meters) meteor broke up over Chelyabinsk, Russia, in 2013 with such force that it shattered windows and caused injuries to residents below. "Compared to a meteorite, the lab is coming in slower and at a much shallower angle," McDowell said. "The debris will be spread over hundreds of kilometers along the line of travel. You'll see the fireball when it is between 50 km and 20 km [31 miles and 12 miles] up, and any debris that doesn't melt all the way may hit a long way downrange." Some observers have compared Tiangong-1's descent to the spectacular crash of NASA's 100-ton (91 metric tons) Skylab space station in 1979, which scattered debris in rural Australia. But McDowell said only a small portion of Tiangong-1 will survive and make it to Earth's surface. Because the space station weighs about 18,740 lbs. (8,500 kilograms), McDowell estimates that about 220 to 440 lbs. (100 to 200 kg) will survive the descent.